Butterfly Baby Place: Bugs and Butterflies Apron perfect for my cutie patootie - or yours! 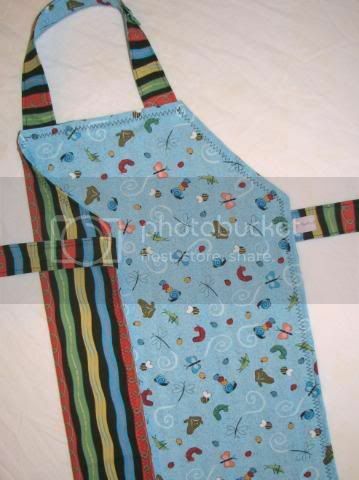 Bugs and Butterflies Apron perfect for my cutie patootie - or yours! I just made this apron this week and I'm absolutely in love with the fabric. It was a dream to work with (thank you P&B Textiles) and so stinkin' cute! I recently found that they have different colors that are the same design, including pink. If this sells well, that will definitely be going in my stash! Even Hayden loves it!! That's the best pic of my toddler I've been able to capture in a long time. Hi there! I found you from my friend from church, Kim Heary. I love your stuff (and I love Etsy!) and am wondering what how much your aprons cost? I'd love to get one for my sons, along with a chef's hat if you make those.